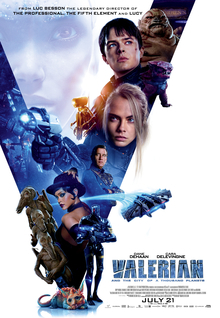 Valerian and the City of a Thousand Planets is a French-made science fiction film based on the long-running French comics series, Valérian and Laureline. It was something a little different in the summer of superhero movies, post-apocalyptic fiction, and so forth, and even though it’s technically an adaptation, it’s refreshing change from the endless sequels and remakes. Valerian has been regarded as a flop, but I actually liked it. Not only is it a refreshing change from the endless sequels, but it’s very optimistic in some ways, hearkening back to Star Trek and the “strange new worlds” sci-fi that we really don’t get enough of anymore. And even though Valerian is no Star Trek (it’s a typical action movie in space), it’s a fun movie to watch. I said Valerian was optimistic, and it really pours that optimism into its opening scene. Here, we begin with the Apollo-Soyuz mission of 1975 in which American and Soviet astronauts met in space for the first time. Then, we shift to Chinese astronauts docking their own spacecraft at an expanded International Space Station. As the station grows over decades, more and more Earth countries and, later, alien species add their contributions to the structure, until it grows so large that it has to be moved out of orbit. It’s a beautiful portrayal of unity of humankind and alien civilizations, all set to the music of David Bowie’s Space Oddity. Honestly, the movie is worth it for the opening scene alone, but the rest of it has its merits. We see the mysterious destruction of the planet Mül and its equally mysterious connection to the intergalactic “federal agents” Valerian and Laureline. What follows includes a fun romp to bust some criminals in an interdimensional market, a Star Wars-inspired spaceship chase through a giant space station, absurd shenanigans with brain-eating aliens (it makes sense in context), and more. Ultimately, the story comes down to a fight with a corrupt authority—the ones who deliberately wrote off Mül as collateral damage in an unspecified war—and the effort to save the victims of the subsequent cover-up. It’s a depressingly common narrative in this day and age, but really, this is a story about federal agents, not explorers, so it’s not hard to take it in stride. This movie isn’t as strong as it could have been. There’s not any particular point where it’s truly weak, though. I think my biggest criticism is that I wanted to see more of the City of a Thousand Planets. The writers created this amazing, rich world with thousands of alien species living side by side, but we got little more than a glimpse of the huge variety of environments that weren’t just a Coruscant knockoff. This unused potential is what I most wish could have been changed about this film. This entry was posted in Movie Reviews and tagged Valerian, Valerian and the City of a Thousand Planets. Bookmark the permalink. I’m glad I wasn’t the only one who found the negative critiques to be totally wrong. A fine film. Thanks for the review. A pretty goofy movie that’s a little bit of fun, too. Nice review. I have read many movie reviews before your but your review about valerian and the city of a thousand planets brings me a different thought about this movie. All most reviews which I have read recommended to watch this movie. But your and this review at https://moviesz.center/valerian-and-the-city-of-a-thousand-planets/ give me another choosen. Thank your review so much! I think I should watch another movie.